Dr Moushumi Ghosh (Professor) joined Department of Biotechnology, Thapar Institute of Engineering & Technology in the year 2003. She obtained her doctoral degree in Biotechnology from Banaras Hindu University, Varanasi, India. As a guest scientist for her post doctoral research at GSF Centre for Environment and Health, Munich, Germany, she worked on metagenomics for characterizing the microbes in the PCB contaminated acquifers in Bittefeld. Environmental biotechnology, Microbial Technoogy, Biochemistry and Biotechniques. She has been the principal investigator of 10 research projects funded by national agencies till date and has over 145 articles published in peer reviewed international journals. Dr Ghosh has won several awards and distinctions, notably the prestigious Noel Derr gold medal for her contributions for bioprocesses to afford clean environment; she was awarded the bilateral INDO UK IERI project for developing novel microarray based detection methods for water borne pathogens in collaboration with Heriot Watt University and University of Edinburgh, UK. She received the 5th EET-CRS Science & Technology Award for outstanding scientific contribution and ADSF Global award for best academic researcher in 2017. Her scientific contributions have been documented as policy and science based advocacy for bio-based economy. She has contributed actively in several national and international scientific societies including the prestigious OWSD (UN)Trieste in 2015; chaired and acted as advisory for prestigious scientific conferences including the American Association for Advancement of science.She was delivered several invited talks at distinguished forums, recent ones being at Centre For Innovative & Applied Bioprocessing(CIAB, Govt of India), Workshop on Erasmus+, Jean Monnet and Marie Sklodowska – Curie Actions (MSCA's) for Indian Vice Chancellors and Head of Higher Education Institutions organized by EU. Dr Ghosh has organized an INDO-UK workshop on sustainable polymer applications. Also organized CATALYST (Collegiate Alliance for Training & Advanced Learning for Transforming Young Scientists &Technologists) an advanced industry-skilling programmes with GE Health Care & Life sciences for capacity development and enhancing the employability of students, She popularized biotechnology applications for masses through outreach activities involving summer camp, panel discussion programme, press / public media. 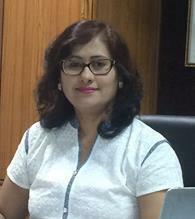 She is a reviewer of Springer, Elsevier, Taylor & Francis and research projects funded by national and international organizations.Her present research endeavours include: Development of antibiofilm-quorum quencher molecules, applications of electrogenic bacterial nanowires in microbial fuel cells and other sensors, novel microbial biopolymers for delivering therapeutic molecules. Her quality teaching approach centres on her successfull implemention of learning under ‘New directions’ programme of CAPSL (Trinity College, Dublin).She has actively mentored students and is presently liasoning with biotech industries and international academic institutions of repute for placement of Biotechnology students.